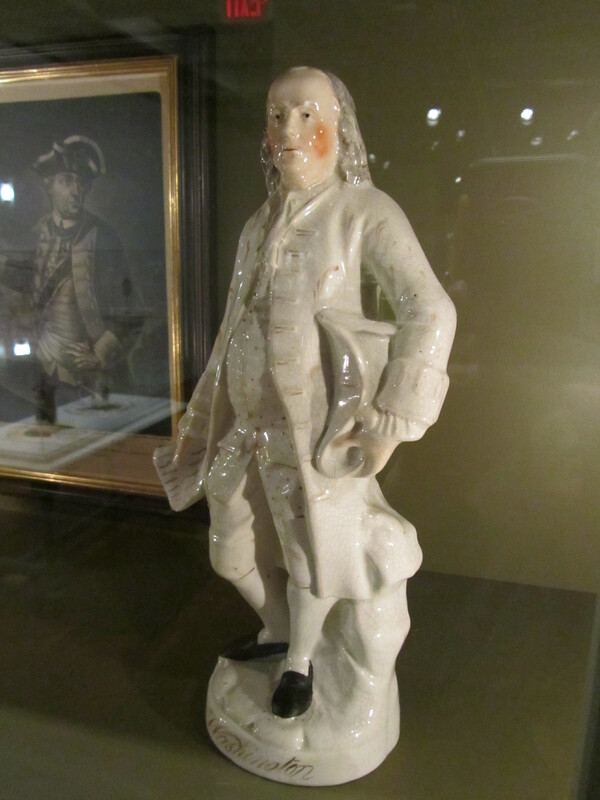 English (Staffordshire), Figure of Benjamin Franklin, 1780-1800. Milwaukee Art Museum, Gift of Mr. and Mrs. Floyd A. Segel, M1984.111. President Barack Obama has one of the world’s most famous faces. It would be hard to imagine a newspaper or a t-shirt maker or a sculptor getting away with substituting a similar grin and telling us it was our President. I suspect we’d know the difference. But if this were the 18th century, we may be none the wiser. After the American Revolution, the first United States president George Washington was a mega-star. His likeness was celebrated on plates, prints, money, and everything in between. But his was an age before photography. Paparazzi were not snapping Washington as he emerged from a carriage, or angling to get photos of him in his swimsuit at Mount Vernon. In contrast, most citizens didn’t really have evidence of what their beloved American President actually looked like. In honor of President’s Day, here are two objects on view in the Museum that show that great liberties were sometimes taken in presenting the image of George Washington. English, Figure of Benjamin Franklin (detail), 1780-1800. Milwaukee Art Museum, Gift of Mr. and Mrs. Floyd A. Segel, M1984.111. On view in the lower level decorative arts galleries, inside the Loca Miraculi: Rooms of Wonder installation, in a case called “Errata” (“wrong things”), an English earthenware figure stands, carefully modeled and hand-painted to depict one of the most iconic American patriots (above). The portly figure wears a waistcoat pulled tightly around his belly. One hand tucks a tricorne hat under his arm. The other arm clutches no-doubt-important letters. The man’s cheeks are carefully enameled pink, his shoes black, and the details of his costume gold. This great Patriot looks familiar, but he doesn’t exactly look like a celebrated war hero. Can we believe the “Washington” written in gold enamel across the base? In fact… Doesn’t the man shown look suspiciously like Benjamin Franklin? If we are to trust Joseph Siffred Duplessis’s ca. 1785 painting of Franklin in The National Portrait Gallery, this figurine depicts not Washington, but Benjamin Franklin, inventor and patriot extraordinaire, with the flowing gray locks we know so well from the $100 bill. "Alexander Campbell", published by "C. Shepherd" (London), "George Washington, Esq. General and Commander in Chief", 1775. On loan from the Chipstone Foundation. In the same case, behind the ceramic figure, is a mezzotint image labeled “George Washington, Esq. General and Commander in Chief”. It features a fine looking gentleman with all the military bells and whistles, but he looks nothing like the man on my $1 bill. 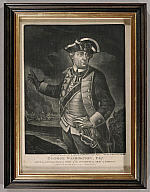 This English print says in script that it was drawn from life, but in fact Washington’s name was applied to the likeness of another person, or even to an entirely fictionalized being. Again, most people had no way of knowing the difference, so this erroneous print proved quite popular with 18th century patriots. Too bad Franklin hadn’t invented an 18th century version of Google Images–surely then they’d have caught this mistake sooner. Instead, these images live on, amusing visitors for years to come in the Museum’s Lower Level. This entry was posted in Art, Curatorial and tagged 18th Century Art, American Art, Benjamin Franklin, Ceramics, George Washington, presidents, prints, Staffordshire. Bookmark the permalink. I’m in Cardiff in the UK and my father has the same statue but with a lot more colour. We had been told many years ago that the figure was infact Benjamin Frankin, and was interested to see your article. Do you know if there are many of these figures about? there are no markings on the one we have to know it’s origin? Thanks for your comment, Karen. I’m afraid we do not know all that much more about the figure either, at this point. We have it as a Staffordshire figure, Earthenware with hand-painted enamel, and there are no additional markings on the base. 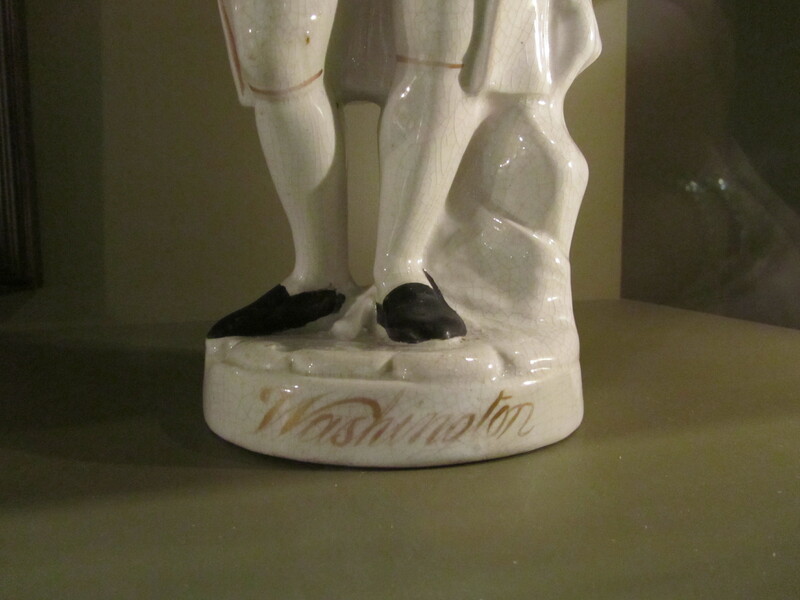 Just the erroneous “Washington” painted on the base, when in fact it is a figure of Benjamin Franklin.